I was rooting around in an old duffle bag the other day and I stumbled upon the lensatic compass I carried for years in the Army. during Operation Desert Shield/Desert Storm. and soils analysis in the northern Saudi Arabian desert. famous ‘left hook’ maneuver was feasible. It is pretty beat up. It was already used when it was issued to me back in 1989, and I used it a lot in places like Honduras, Saudi Arabia, Kuwait, Iraq, Korea, Panama and across the US. Like a lot of things military, it is somewhat overbuilt; a big green chunk of aluminum housing a compass. It was one of those pieces of equipment that you forgot about until you needed it, and when you needed it (particularly in places like Iraq or Panama), you needed it bad. Whenever I opened it and let the compass card swing free I would always let out a little sigh of relief as the arrow settled down and pointed the way north. 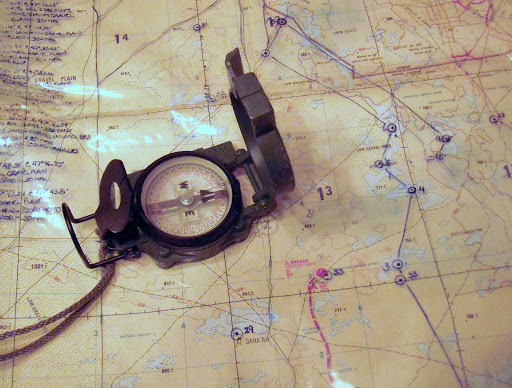 My compass never failed, and that is what we should expect of a compass – it should never fail to point the way. And they rarely do. That is the absolute beauty of the compass as a navigational instrument. It is so simple in concept and design that even poorly made examples do just what we ask of them – point the way north. The compass is the most basic navigation tool and certainly one of the first, if not the first man-made navigation tool. Before the compass there was… the human eye? Well, we had maps of a sort, but they are really not direction finding tools. Humans had spent thousands of years studying the skies with the naked eye, and got pretty good at estimating location, direction, seasons, etc. using the stars. Certain groups like the Pacific Islanders even got damned good at open water navigation using just the stars, very rudimentary maps (made of woven plant material and shell) and an intimate knowledge of sea conditions and winds. But what happened when the clouds closed in and the heavens disappeared? Mankind was lost. Literally, lost. What was needed was a device that pointed the way. The compass is a device so ancient that it’s true origins are all but lost to us, shrouded in history and mystery and claimed by so many civilizations that the real story will probably never be known. What we do know is that the properties of the mysterious lodestone (the mineral magnetite) were known to multiple civilizations at the same time. Mostly it was viewed as a magical substance, it’s attractant properties giving it special medicinal powers. Ancient physicians concocted all sorts of uses for lodestone, claiming it cured everything from skin rashes to the plague. Even today you can go on Amazon.com and buy bags of lodestones labeled for use in ‘natural healing’ practices. (Aroma therapy candles and Yanni’s greatest hits, anyone?). While it is generally acknowledged that it was the Chinese who discovered the direction finding properties of the lodestone, they never matured the technology beyond the most basic design. A magnetized chunk of iron (shaped like a fish) suspended in a bowl of water. Alas, it seems they never got much past this stage of development. What is known is that someone, somewhere, magnetized an iron nail or needle with a lodestone and then noticed that the needle acquired magical properties. The first thing noted is that when suspended by string or floated on water the needle would swing freely and always pointed in the same direction, as though guided by a mysterious, unseen hand. The next magical property was that it always pointed to the pole star, or Polaris. At first this phenomena only served to enhance the perception of the magical properties of the lodestone – if it can impart such magical behavior to a simple iron needle then surely, surely, it must be capable of imparting even more wondrous effects to the human body. Or predicting the future. Or curing the insanity. Or defeating enemy armies. Or… Well, you pick an application, because folks back in the Middle Ages thought the lodestone was the answer to just about every problem afflicting humanity. Eventually someone, most likely a seafarer, figured out that if this magnetized needle always pointed north, regardless of the weather, then it could be useful for indicating direction while at sea. This sharp sailor probably lived along the west coast of Italy in the 13th Century in one of the bustling centers of seagoing commerce scattered up and down the coast, from Genoa in the north to Salerno in the south. 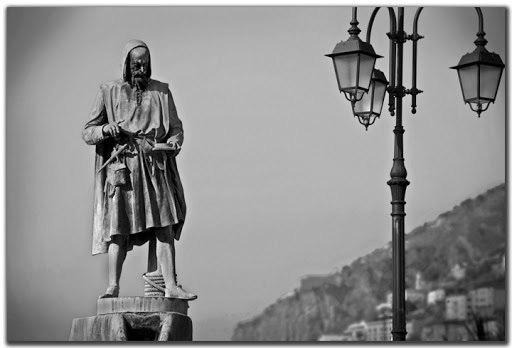 Italian legend attributes the development of the navigational compass to a guy named Flavio Gioia, who lived in a town just outside of Salerno in the early 14th Century. Scholarship casts serious doubt on this claim, but since nobody has come up with a better story the Italians are sticking with it. Plus, it’s good for the tourist trade. and we’ll run with it! What is known is that once the navigational compass was developed it’s use exploded across the Mediterranean Sea, and then across the known world. I have no doubt that hundreds of 14th Century sailors, stepping aboard a ship carrying one of those newfangled compasses and being told that it uses a needle magnetized by a lodestone, smacked themselves on the forehead and shouted “Why didn’t I think of that?” It was that obvious. The compass is such a simple tool that everything that came after was merely a refinement on the initial design. Basic refinements came quickly – improvements in indicating direction (development of the compass ‘card’), improvements in mounting and suspeding the needle, improvements in housing the device aboard ship. The basic compass design was quickly brought ashore and miniaturized, and small and easy to carry compasses began to appear. 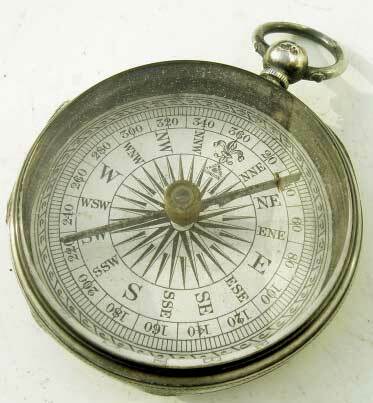 For centuries, however, the compass remained a simple device – a needle placed against an indicator that showed the cardinal directions (North, South, East, West, Northeast, Southwest, North Northeast, etc.). This design seems to have prevailed right up into the 19th Century. An F. Barker & Son pocket compass from 1858.
and degree indicators (01 – 360). What took place in the intervening years was an increased understanding of the properties of magnetisim in general and the magnetic properties of the Earth in particular. 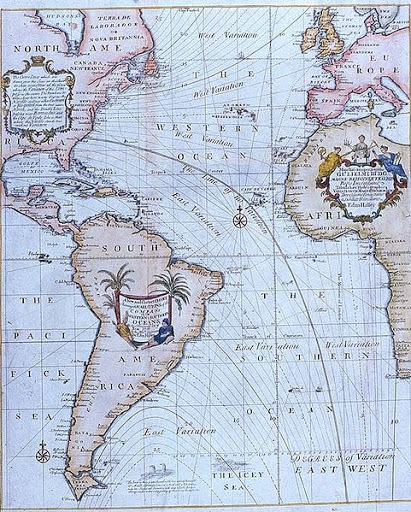 Scientists and experienced navigators had know for years that the magnetic compass didn’t point directly to the pole star, but pointed to the east or west of Polaris depending on where you were in the world. During the Age of Exploration it was observed that the needle was off a few degrees either direction in most of the northern hemisphere. In a few places the alignment was perfect – the needle pointed straight north, other places it pointed almost due east or west (particularly at high latitudes), but generally it was just a few degrees off from Polaris. This fluctuation was not consistent – a scientist or a navigator could not accurately predict what the magnetic difference would be at a future location based on observations at his current location. Keen observers also saw that the needle itself would not always float horizonally, but would ‘dip’ just a little bit at different locations. Even more mysterious and concerning, scientists and navigators that returned to the same spot again and again over a period of years noted that the amount of magnetic variation differed. It was as though something unseen was causing the needle to shift over time. These observations eventually led to the understanding that the Earth itself is a giant magnet and that the compass needle is not ‘pointing’ north, but the needle is aligning itself with the Earth’s own natural lines of magnetic influence. This discovery moved the compass from the realm of ‘mysterious instrument’ to ‘well understood tool’. It also triggered the realization that the compass is a flawed tool, inaccurate and erratic, and to be truly useful for safe navigation its relationship with what we now call true north must be studied, understood and applied. kinda’ sorta’ figured it out back in the early 1600s. I won’t dive into the details, but Western nations alone or in concert expended huge amounts of money studying the earth’s magnetic properties. First to apply it to a better understanding of compass accuracy and later to better understand complex geodynamic principles. (For example, it is the existence of the Earth’s magnetic fields that first led geophyisicists to deduce that the Earth’s core is little more than a huge chunk of iron). 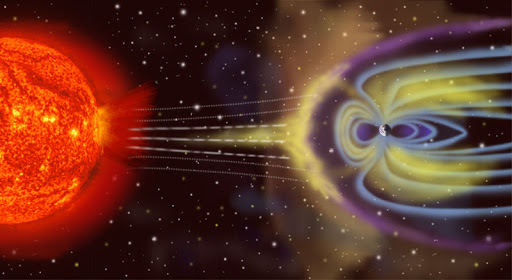 The study of magnetisim is still a leading discipline, as scientists work to understand how the Earth’s magnetic field acts as a shield from a lot of the nasty stuff the Sun throws at us, or how a panetary body’s magnetic field can yield enromous information about its interior structure. Compass users are the happy beneficiaries of a lot of this research, since we now have an intimate understanding of how the Earth’s magnetic field influences our compass bearings. nasty stuff the Sun sends our way. Today the answer is obvious to us. The Earth is a giant magnet that has a geographic north and south pole (where the lines of longitude converge) and a magnetic north and south pole (where the magnetic lines of influence converge). The two don’t match. In fact, they aren’t even close. Today the magnetic north pole is located high in the Canadian Arctic about 535 miles south of the geographic north pole, and it is always moving. The magnetic pole shifts slightly every day in response to influences like solar storms, and over time it drifts – right now it appears to be set to wander over the polar region and settle somewhere in northern Siberia in the next 50 years. While the thought of a wandering pole may cause some readers distress the good news it that we know where its headed and we can accurately track its progress. If we know precisely where the north pole is located day-to-day we can quickly and accurately calculate the variation between magnetic north and true north for any point on earth. This calculated difference between magnetic north and true north is known as magnetic declination. The difference between True North and Magnetic North. 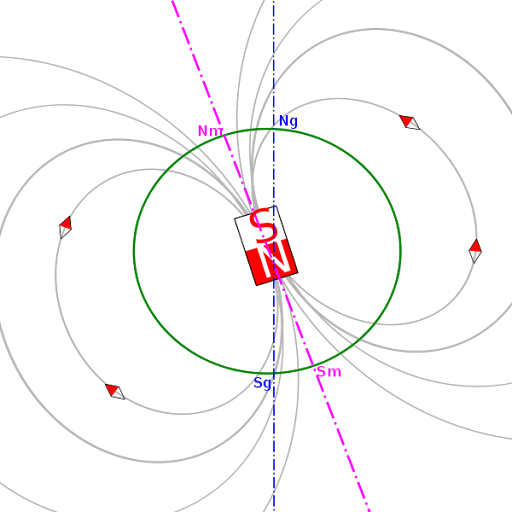 The angular distance between the two poles is what we refer to as magnetic declination. But why is the south end of the needle pointing North? Remember your basic principles of magnetism – opposites attract. The end of your compass needle that indicates North is actually the south end! In years past governments would periodically publish maps showing lines of magnetic influence, or isogonic lines and include instructions on how to calculate updated declination based on the predicted drift. However, today you can access one of several web sites that allow you to input your current location and calculate an accurate magnetic declination. This means you can know precisely the relationship between magnetic north as indicated by your compass and true north, and compensate for declination either directly on the compass or in later calculations. Knowing the magnetic declination for your location or region and compensating for it is the key step to accurate navigation using a compass! Once you have mastered this task you can get yourself from one point to the next with confidence. Whew! We’ve covered a lot in this posting. I’ll pause here to let you digest what I’ve presented and to let you do a bit of your own research if you are so inclined. There are a lot of great resources on these topics available on the web, many of which I’ve linked to in this posting. Let me add one more link to a NOAA web movie that does a great job of portraying the relationship between the movement of the magnetic poles and the corresponding shifting of the isogonic lines over time. In the future we’ll take a look at modern compass design and land navigation techniques. This entry was posted in compass, History and tagged compass by Brian Haren. Bookmark the permalink.